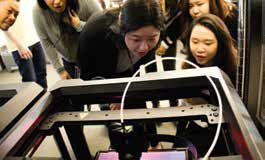 3D printers are a powerful tool for learning and collaboration, but it can be a challenge for educators to integrate their use in the classroom. To help bridge this gap, MakerBot recently added a new feature to Thingiverse. Users can now share and discover project ideas from around the globe. MakerBot is kick-starting this effort with the #MakerEd Challenge, an invitation for users to share 3D design projects on Thingiverse with an STL file, photo, summary, description, any tips, and a tag. The winner will receive a MakerBot Replicator (5th generation) with MakerCare and their design will be featured on Thingiverse.